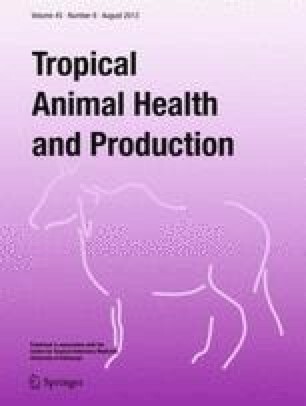 Growth and digestibility experiments were conducted on growing East African type goats offered Chloris gayana hay supplemented with one of three high-protein (119–128 g CP/kg DM) legume hays, Cassia rotundifolia (cassia), Lablab purpureus (lablab) or Macroptilium atropurpureum (siratro), and crushed maize to investigate the feed intake, digestibility, growth and urinary excretion of purine derivatives. Goats in the supplemented groups had higher total dry matter and nitrogen intakes and higher N retention and body mass gains than unsupplemented counterparts. The digestibility of dry matter, organic matter and neutral detergent fibre were increased by protein supplementation. Animals on supplemented diets had higher fractional outflow rates of particulate matter from the rumen. The production of protein by ruminal microbes and the efficiency of microbial N production were increased by supplementation. It was concluded that a mixture of low-quality grass hay (61.9 CP/kg DM) and either cassia, lablab or siratro hay, and maize grain can provide a productive balanced diet for growing goats.